Inside: Learn how to make the most delicious, cheesy buffalo chicken casserole which is perfect for the holidays all year-round. A couple of years ago we were assigned to take a dish to a church activity with a potato theme. 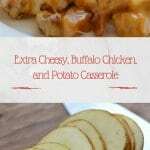 We came up with this recipe for a buffalo chicken casserole, adding potatoes and cheese, and it turned out great! There were a lot of great dishes that people took, but this Buffalo Chicken Casserole was definitely one of the favorites. We knew that was the case, because so many people asked for the recipe. The reason for the potato theme was because they were holding a “potato pinewood derby.” Everyone got a large potato and had to carve it and add wheels and other decals and stickers in order to make a potato-car. Then everyone got to race their potato cars down the pinewood derby tracks. We ended up having one of the fastest cars and we actually were one of the top finalists! We actually made it to the championship race. Unfortunately, we fell a little bit short, coming in second place. In the end that didn’t matter because we had a lot of fun! We came up with this recipe after some experimentation, and the result was great. We have since made a few changes to it, and I think that it is even better. This meal is perfect for a nice, fast and easy meal. We love to make it during the holidays, like Christmas and Easter. The first time we made this, we just used some regular buffalo sauce. It was good, but I always like to mix things up a little bit to see if I can make it even better. For this version of buffalo chicken casserole, we used the same buffalo sauce that we used on our popular homemade Buffalo Wings recipe. That made all the difference, and this is one of our favorites. After combining the chicken with the buffalo sauce and potatoes, you will top it with cheese, bacon, and green onions before baking. 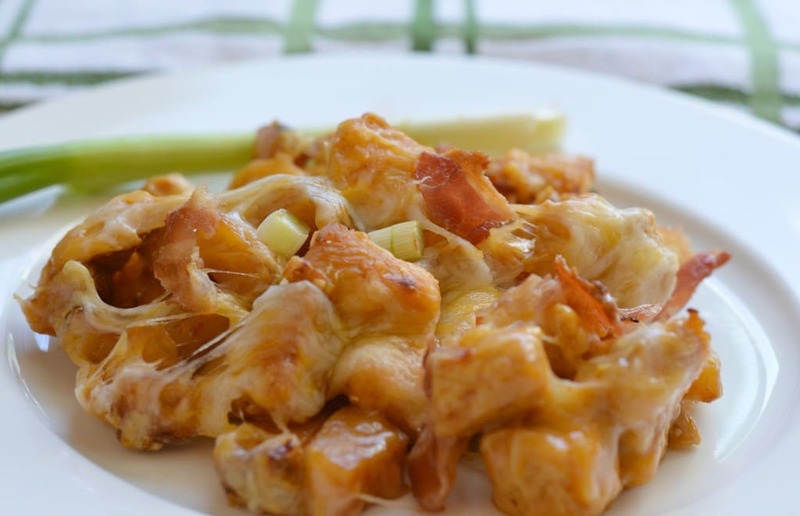 The combination of potatoes, cheese, bacon, and buffalo chicken is so yummy! I would love to hear how it turns out when you try it, so leave a comment below! Sharp knives for cutting the chicken and the potatoes. Wash the potatoes and chop into small cubes. Season the potatoes with paprika, salt, pepper, cumin, and garlic powder and toss together. Make the buffalo sauce by melting the butter over medium heat and then adding the molasses and buffalo sauce. Let simmer for a couple of minutes. Pour 1/2 of the buffalo sauce over the potatoes and mix well. Put the potatoes on a baking pan and bake at 400 degrees for about 10-15 minutes. Set aside. 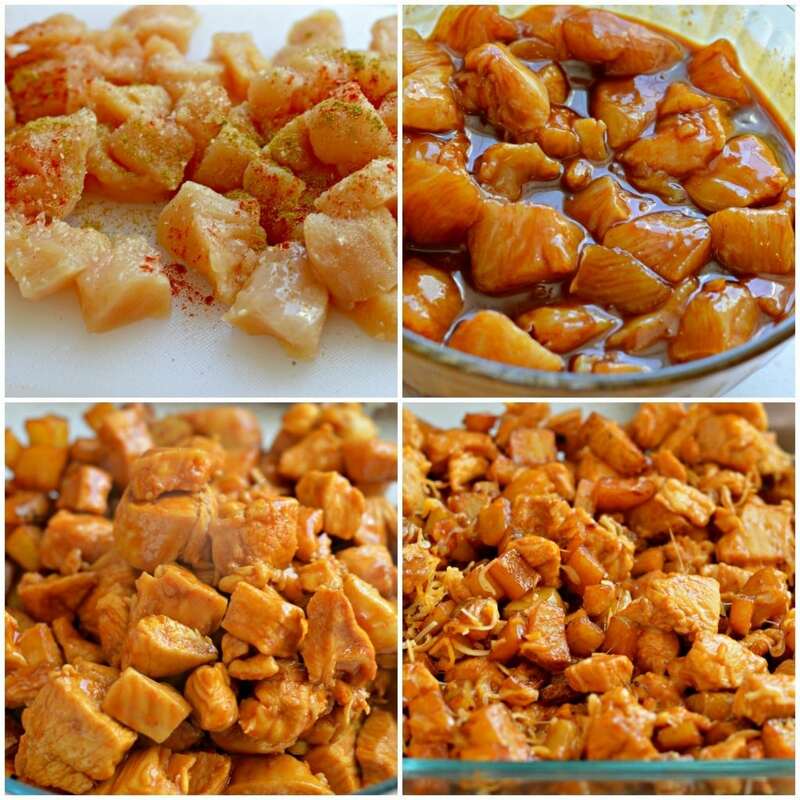 Cut the chicken into cubes, season the same was as the potatoes, and then combine with the remaining buffalo sauce, mix well. Cook the chicken on a skillet until cooked through. Combined the cooked chicken and the cooked potatoes in a large bowl with the shredded cheese and mix well. 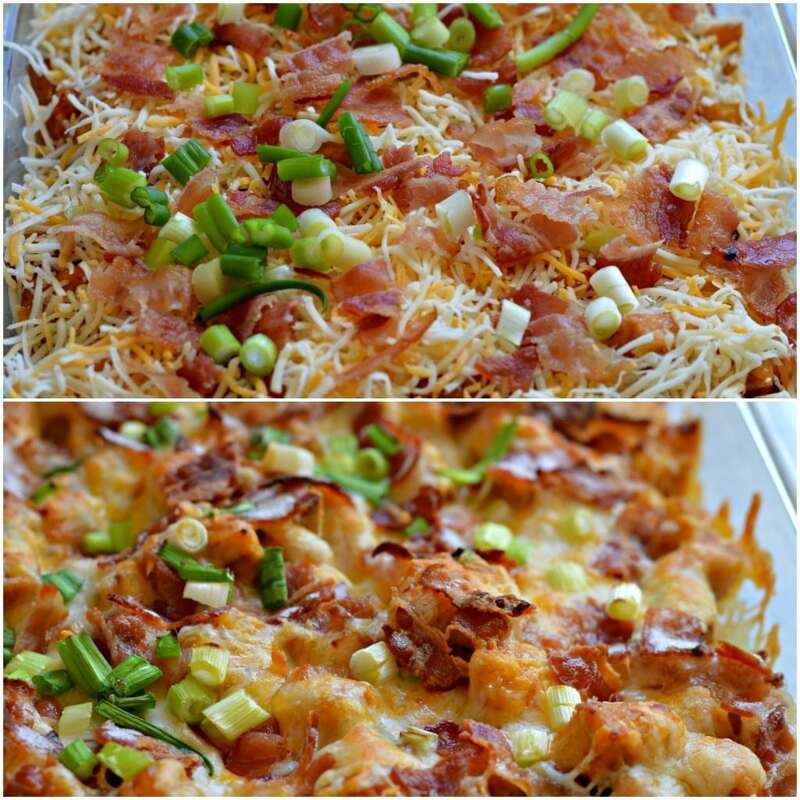 Pour the entire mixture into a glass baking dish and top with remaining cheese, crumbled bacon, and chopped green onion. 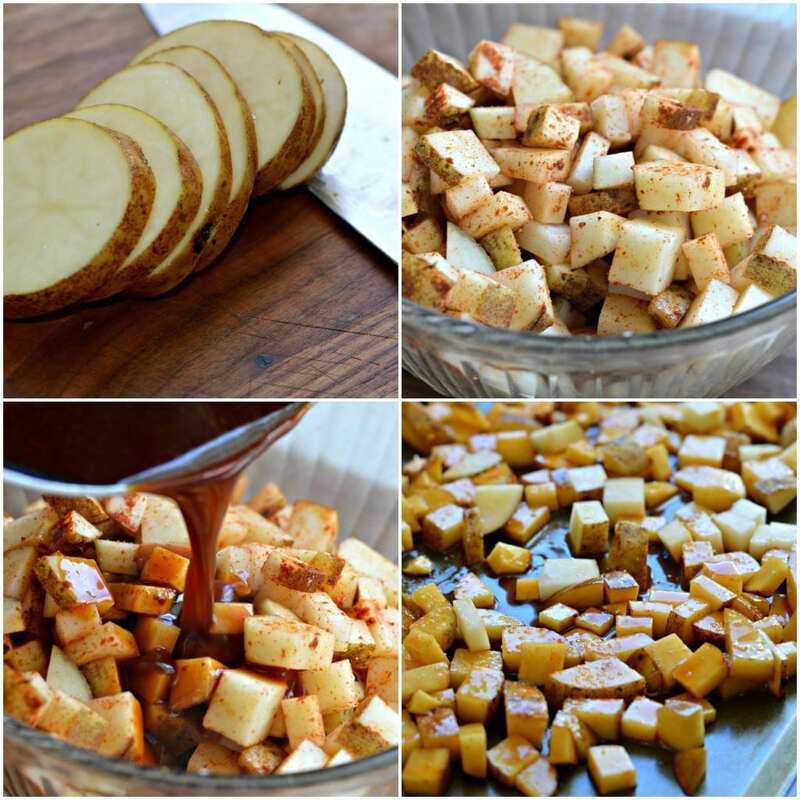 « Papas al Horno En Salsa de Bufalo y Queso.